If you're a regular reader of my blog, you might ask: "Why should I care about this?" It's extremely simple: The future of business is here, and if you're a consumer, then you'll be happy with what Solis discusses in his new book. If you're a marketer, you just might be scared to death if you're not already changing how you work. Early in the book, Solis includes a list of companies that have not survived: Borders, Compaq, Kodak, LIFE, Tower Records, Woolworth . . . The list goes on. All of these companies were not able to survive in the changing economic climate and what gives me hope is that at the core of Solis' book is his belief that: "The experience people have with your product, your company, your representatives, define the brand through the expressions they share. Your work must focus on expressions, not impressions." To boil that down, it's the experiences that people have with your brand that's important. Fellow authors out there might want to take note: It's how we're engaging our readers that is important and the experience around how our books are discovered that's essential to the new business. Case in point: In the traditional way of marketing, a company has a massive mailing list and they would send out print materials, email blasts and work with the advertising department to buy print and TV ads. Today customers are talking about products on their own on social platforms. When they want a recommendation for a book, restaurant, service, etc., they reach out to their friends and family on Facebook or Yelp. And whatever information they have on the subject, that's how a brand is going to be relevant or not. "We had a vision, to be the first company that was fully digital end-to-end. The experience would be that a customer has total access to Burberry, across any device, anywhere. They get exactly the same feeling of the brand and feeling of the culture, regardless of how, when and where they were accessing the brand. Everyone can come to Burberry World and understand the journey and mission that Burberry is on." Ahrendts' statement is bold and visionary. Because of new technology, change in business is happening faster than corporations can adapt. The opportunity here is to engage people on a human level. Companies cannot simply throw up a Facebook page and then boast that they have thousands of "likes." That doesn't mean anything and doesn't translate to good strategy. No, what matters is that corporations are listening to their consumers and interacting with them in real time. The experience that customers are having is rewarding to them and taking place in various digital environments. Change is here now and Solis' book lays out a solid plan for how to move forward so that we can also be nimble and adapt like Burberry. As a consumer, I was happy to read Solis' suggestions to corporations on how best to engage me. And as an author, I obtained more insight into how I can be more relevant and obtain more of a readership for my novels. I also took a lot to heart on how I can best use what I learned for my job in electronic communications at Temple University. The book is filled with great examples, but at its core, reading this book is an extremely unique experience. The table of contents, the layout, graphs and how the text is proportioned in bite-sized pieces reflects a unique visionary approach. I was able to ask Solis about the physical makeup of the book and he confirmed that he had specifically planned the book to be special in ts design. To read the book, is to experience it (as odd as that might sound). 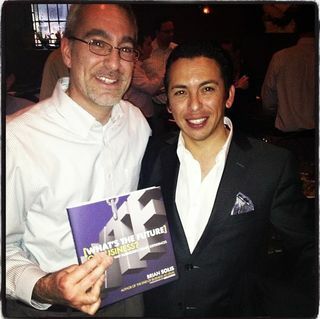 Brian Solis (right) at the 2013 Philly meetup. If you're willing to learn about how we need to change how businesses market to consumers, this book is priceless. I've been sharing this book with coworkers, fellow writers and even have talked about this book with members of my own family over the dinner table. It's a book that asks to be discussed. In a modern economy that's not been strong, the path is clear on how we can adapt and learn new skills to help us not only be competitive in today's workforce, but also agents of change. Buy this book. Pick it up, experience it and then be prepared to talk about it because it's one of the most refreshing books I've read in a long time.